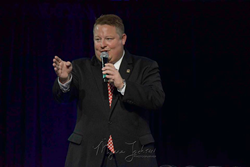 MarkNet Alliance member auctioneers and partners re-committed themselves to their profession and those they serve at the 67th annual National Auctioneer Association (NAA) Conference and Show held July 19-23 in Grand Rapids, Michigan. The NAA is the world’s largest professional association dedicated to providing educational programming and resources to auctioneers and the industry. Jason Winter, CAI, AARE, AMM, CES, (Missouri) was elected from a ticket of four candidates to fill one of two seats on the NAA Board of Directors. Winter will serve a three-year term. JJ Dower (Tennessee) took the gavel as National Auctioneers Foundation President. Highly regarded, long-time auctioneers, Jack Hines, CAI, AARE, GPPA, (Wisconsin) and Randy Wells, CAI, AARE, BAS, CES, GPPA, (Idaho) were inducted into the NAA Hall of Fame at the President’s Gala. To earn this lifetime achievement, inductees must be nominated by a peer and then chosen by a panel of past recipients of the prestigious award. Introduced by a close peer and mentor at the President’s Gala, inductees were unaware of the honor before hearing their names announced then were joined on stage by a surprise processional of family, friends and business associates. The Auxiliary also recognized women who have made significant contributions with inductions into their Hall of Fame. A rare occasion recognizing both husband and wife, Annette Wells, CAI, BAS, (Idaho), wife of Randy Wells, was named to the Auxiliary Hall of Fame. Jane Aumann (Illinois) joined Wells and past Hall of Fame recipients this year as well. After 10 years competing, TJ Freije finally conquered the International Auctioneer Championship (IAC) and was named winner of the Men’s Division. Dustin Rogers, CAI, (North Carolina), took home first runner-up for the second year in a row. Matt Hostetter (Pennsylvania) and Andrew Yoder (West Virginia) made it to the final round but stopped short of placing. Veteran competitor Emily Wears, BAS, ATS, (Wyoming), was a finalist in the Women’s Division. Contestants are judged on their bid calling skills, showmanship and interview questions. The NAA Auxiliary awarded one of its annual scholarships to Caroline Walker (Tennessee). MarkNet Alliance is a national franchise of more than 60 auction companies with proven track records and thriving businesses. The MarkNet model focuses on making local and regional auction companies even more successful by offering technology resources, online auction software, networking opportunities and educational training for auctioneers and staff. Members companies conduct over 6,000 auctions and sold over $1 billion in assets annually.